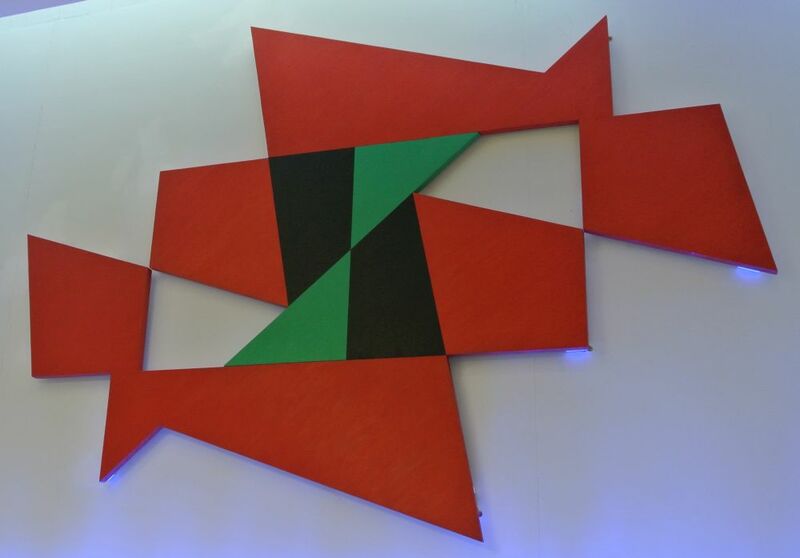 Constructivist artists like Natalie Dower have frequently based their creations on mathematical and scientific systems, as have artists from earlier epochs. In classical Greece and during the Italian Renaissance artists used the Golden Section as a means of achieving visually pleasing proportions in painting and architecture. Other sources of inspiration have been the Fibonacci Series and the Dudeney Dissection, both of which Dower has used to discover forms and relationships which after making extensive preparatory drawings result in the choices she makes when creating her final paintings and three-dimensional works. Red Flyer is based on the second of these systems, discovered by the Victorian mathematician Henry Dudeney in which the square is dissected into four different shapes which can then be rearranged as an equilateral triangle. In an interview with Patrick Morrisey in 2014 she recalled the excitement she felt when she came across this, she realised that it offered an enormous range of possibilities and for the next decade all of her work was based on it.